When Paco Alcacer swapped Barcelona for Borussia Dortmund this summer, it was more than just a change of scenery he was seeking. Somewhat lost in Lionel Messi’s shadow, BVB have given him the limelight and support he was craving to ensure he is now making history in his own unique way. His numbers in a Black and Yellow shirt have sent jaws dropping, with Dortmund getting instant payback from Paco. Indeed, a motivated Alcacer sought a new start this summer after two seasons spent largely on the fringes at Barcelona. He made just 17 La Liga appearances in a total of 50 outings for the Blaugrana, contributing 15 goals and providing eight assists. That is still a pretty solid return for a player on the periphery, with Messi, Luis Suarez, Neymar and Philippe Coutinho for company, and a return which pricked more than just a few ears throughout Europe - not least in Dortmund. Being in such company in Catalonia may have been an obstacle in terms of actual game time, but it was a boon for his overall development, and Dortmund guessed as much. "Some may want to think that I might have lost the past two years, but I don't think so," said the Torrent-born striker. "It's clear that I'd have liked to play more, but I’ve improved a lot as a footballer and as a person." Training diligently every day with the Messi and Co. while waiting patiently for an opportunity can be rewarding, and readied Alcacer for when - like now in Dortmund - his opportunity has finally arrived. "I also think he makes you a better footballer," Alcacer said of his days sharing a dressing room and field with a six-time Ballon D'Or winner. "In fact, many of the goals I scored at Barcelona were from his passes." Now, however, he is benefitting from a different supply line. With the likes of Marco Reus, Jadon Sancho, Christian Pulisic and Mario Götze, who needs Messi anyway? Scoring on his debut against Eintracht Frankfurt, he also netted twice at Leverkusen, a hat-trick against Augsburg and, following Matchday 8’s win at Stuttgart, had scored a truly sensational seven Bundesliga goals in just 126 minutes of action. His stunning form also led to a recall to the Spain team, for whom he bagged another three goals in the UEFA Nations League against England and Wales recently. A quintessential fox in in the box, BVB have given Alcacer the platform to become a wolf in double-quick time. The lightning start to his BVB career has coincided with an injury-free campaign for Reus, and when BVB’s talisman is fit, it is simply a given that he performs. Outdoing even Alcacer, the Dortmund native boasts five goals of his own but has assisted just as many, and is positively thriving under new boss Lucien Favre, with whom he worked so well at Borussia Mönchengladbach. Reus has embraced the role of captain, bestowed on him this term, and, now aged 29, is one of the team’s senior pros. He has put an arm around the incoming Alcacer, four years his junior, and their excellent relationship on the field can be explained in part by their closeness off it, despite both having to speak English: a second language for the pair. "Marco's helped me a lot with settling in, both on and off the pitch," says Alcacer. "He's a big part of the reason I feel so good here. He's a world-class leader. I appreciate him a lot. Playing with him is very easy. The quality he has when he's going forward, the timing he has to meet chances and the ease with which he plays. I also benefit from the hard defensive work he puts in with the team." The feeling is most certainly mutual. "He's scoring right now, and I don't have a problem with it, if it continues!" Reus told bundesliga.com after the victory at Stuttgart. "He works a lot for the team and is clinical in front of goal. You can see how much confidence he has. I think he just has to enjoy it, take it all in and keeping working hard." The result of their telepathic understanding has left Dortmund fans already dreaming of big things. Borussia sit top of the league having scored a club-record 29 goals after nine matches, and they are top of their UEFA Champions League group after a stunning 4-0 win over Atletico Madrid. 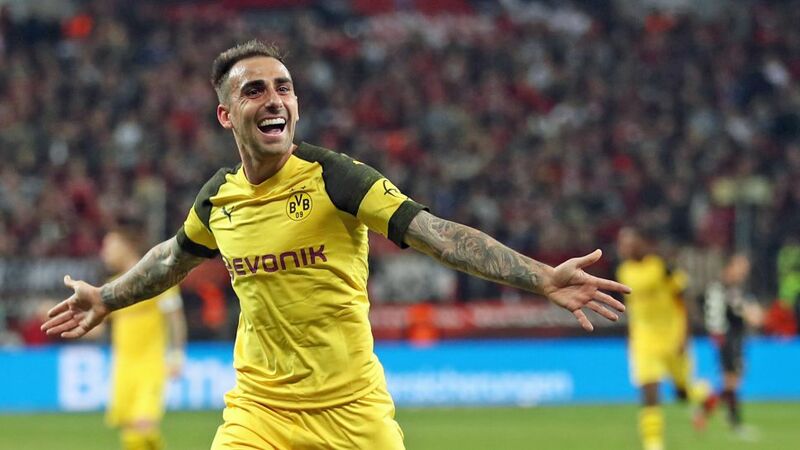 For arguably the most exciting attacking in Europe, and an accomplished Alcacer, a first Bundesliga title since 2012 is a distinct possibility this season.